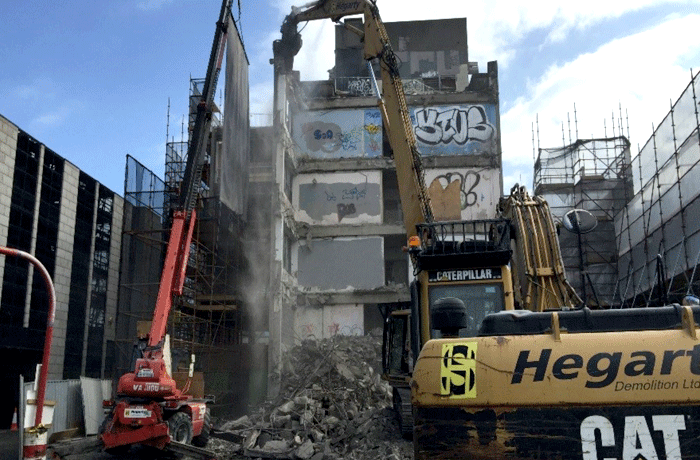 The overall works package comprised of the demolition of 4-5 Storey Office Building and site clearance works at 18 – 21 Charlemont Place, Dublin. The site was bounded by an existing LUAS railine leading onto the Viaduct crossing at Charlemont Place. Attending meetings with RPA/ARUP and preparing detailed methodologies for the part deconstruction and demolition of 5 storey structure directly adjacent to Viaduct and rail line. Preparation of Dilapidation surveys for surrounding structures and areas. Installation of noise, dust and vibration monitoring for the duration of demolition works on site. Carry out full Utilities review and engage utilities companies to disconnect all live services. Sterilise the site and remove all contaminated material. Stripping out and removal of all internal soft furnishing, fixtures. Erection of Protective self-supporting ballast scaffolding along the LUAS line for the duration of demolition works. Design proprietary propping system to backprob slabs/beams and columns to be saw cut and lifted as part of the deconstruct methodology agreed with the RPA. Demolish remaining structure mechanically and segregate arising on site.